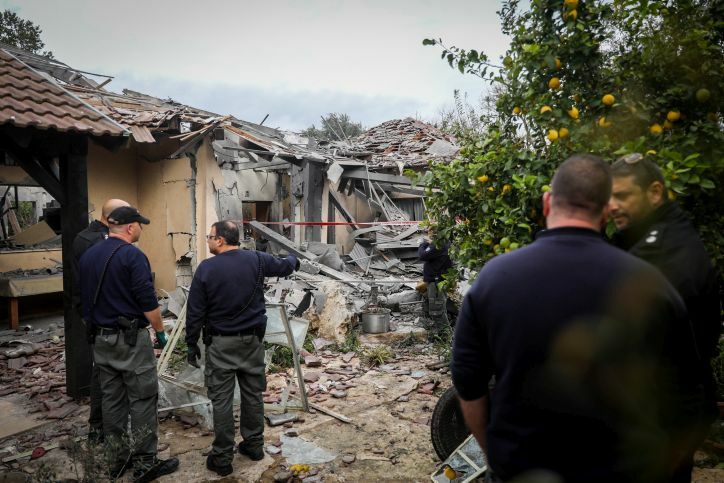 Israeli security forces inspect the scene of a house that was hit by a rocket fired from the Gaza Strip in Moshav Mishmeret, central Israel, on March 25, 2019. Another 30 homes in the moshav were hit by the blast as well, injuring and traumatizing numerous others. The moshav is located about 120 kilometers – 75 miles – from the Rafah area in Gaza, where the missile was launched. Hamas leader Ismail Haniyeh called on operatives throughout the Palestinian Authority, in Jerusalem and “the prisoners and in the prisons” to launch a comprehensive attack on all fronts. “We must fight this comprehensive attack in a unified national way and in coordination with the Arab brothers,” he said.